Message from Pope Benedict XVI: To the people of the UK. 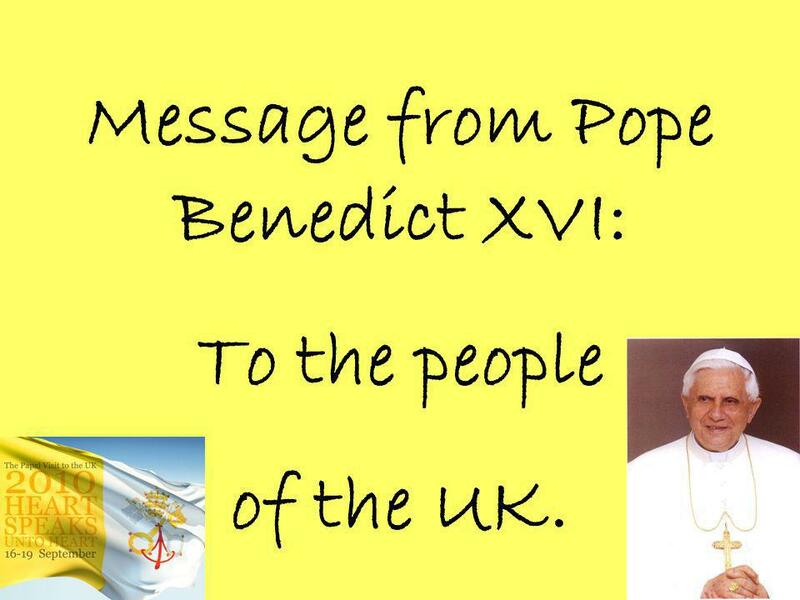 1 Message from Pope Benedict XVI: To the people of the UK. 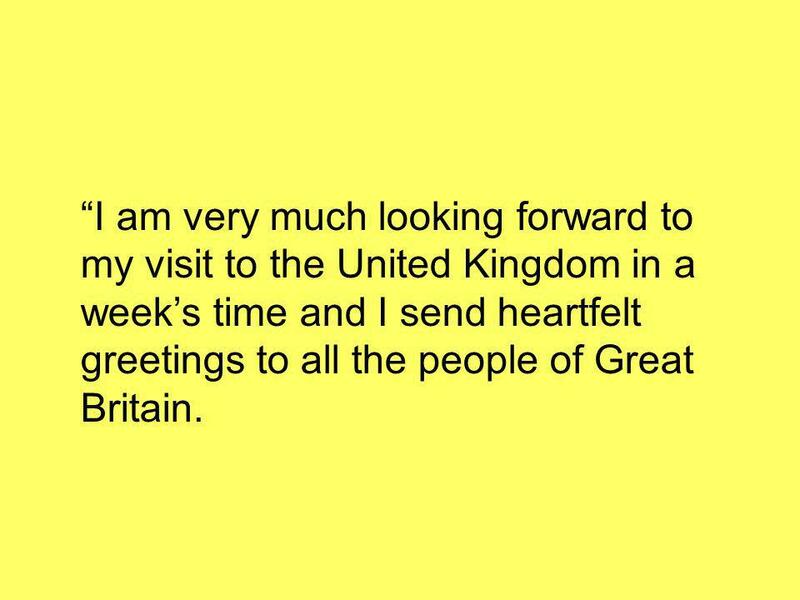 2 I am very much looking forward to my visit to the United Kingdom in a weeks time and I send heartfelt greetings to all the people of Great Britain. 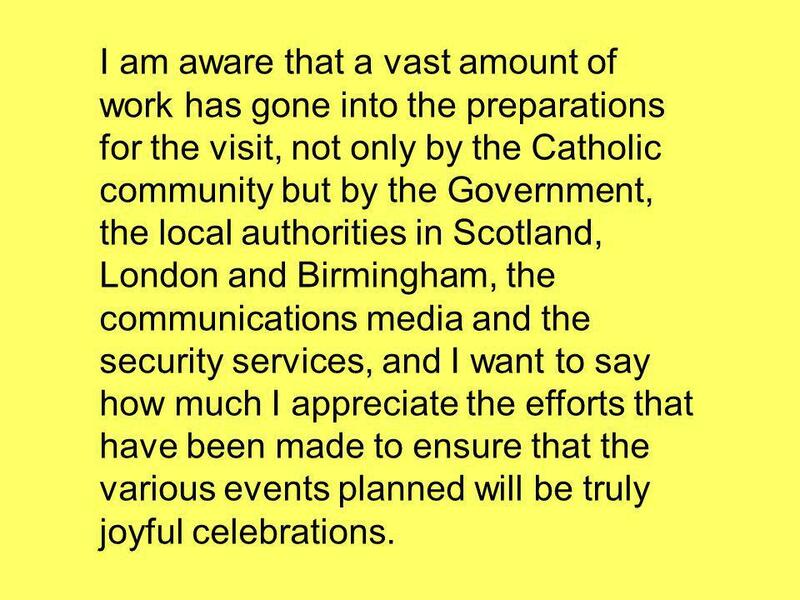 3 I am aware that a vast amount of work has gone into the preparations for the visit, not only by the Catholic community but by the Government, the local authorities in Scotland, London and Birmingham, the communications media and the security services, and I want to say how much I appreciate the efforts that have been made to ensure that the various events planned will be truly joyful celebrations. 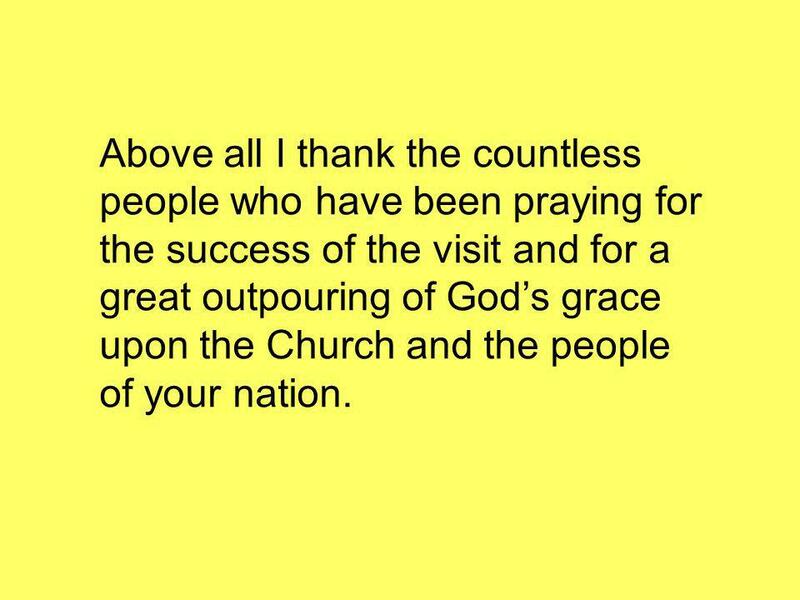 4 Above all I thank the countless people who have been praying for the success of the visit and for a great outpouring of Gods grace upon the Church and the people of your nation. 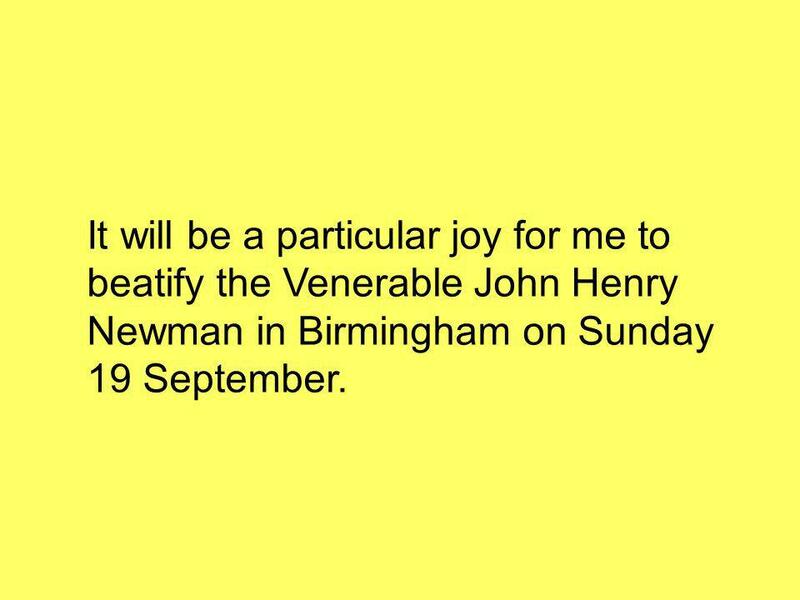 5 It will be a particular joy for me to beatify the Venerable John Henry Newman in Birmingham on Sunday 19 September. 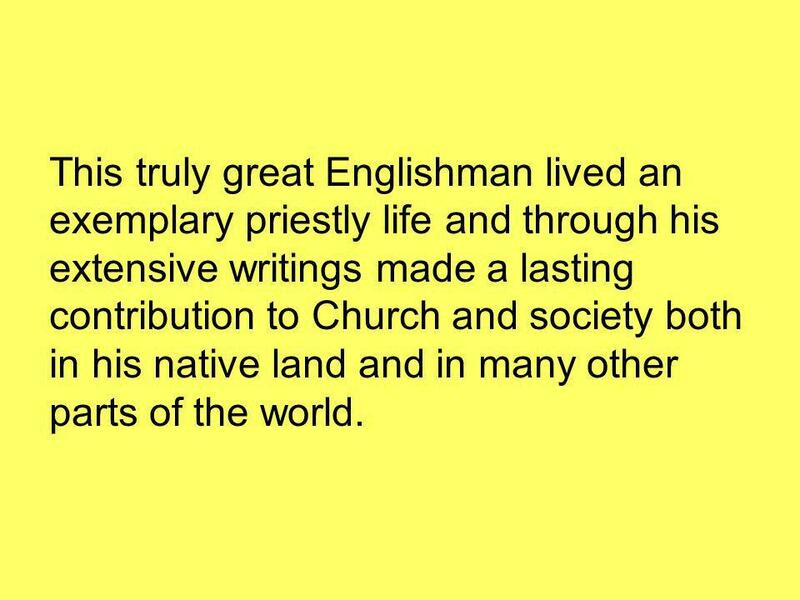 6 This truly great Englishman lived an exemplary priestly life and through his extensive writings made a lasting contribution to Church and society both in his native land and in many other parts of the world. 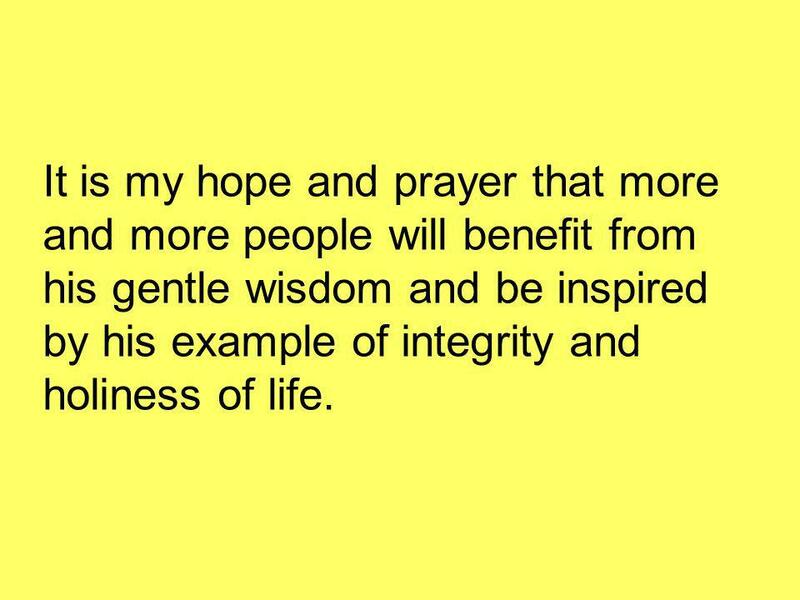 7 It is my hope and prayer that more and more people will benefit from his gentle wisdom and be inspired by his example of integrity and holiness of life. 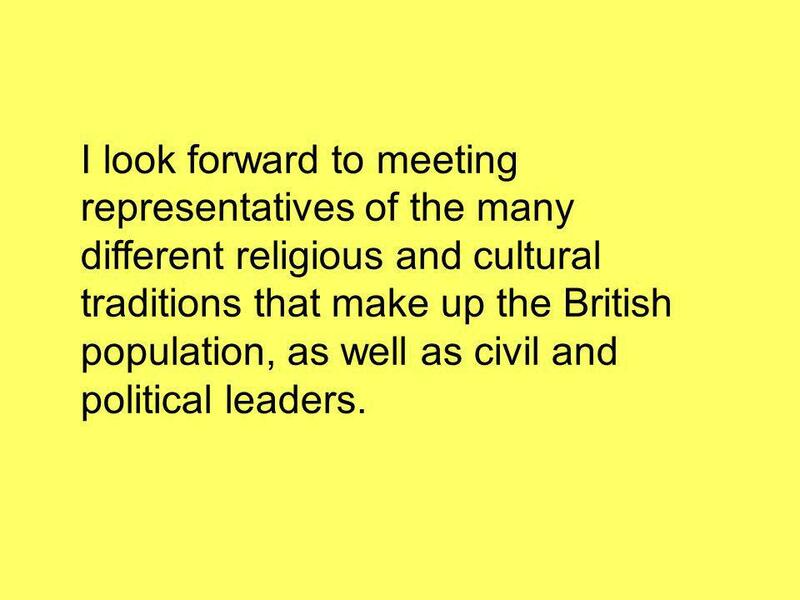 8 I look forward to meeting representatives of the many different religious and cultural traditions that make up the British population, as well as civil and political leaders. 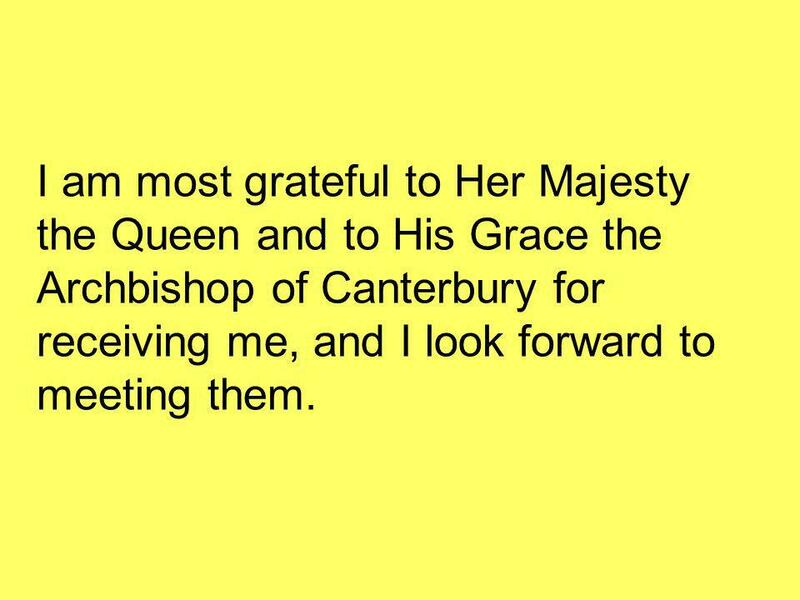 9 I am most grateful to Her Majesty the Queen and to His Grace the Archbishop of Canterbury for receiving me, and I look forward to meeting them. 10 While I regret that there are many places and people I shall not have the opportunity to visit, I want you to know that you are all remembered in my prayers. God bless the people of the United Kingdom!" Download ppt "Message from Pope Benedict XVI: To the people of the UK." Spiritual Bouquet In Preparation for the visit of his Holiness Pope Benedict XVI Part Three For the Youth of the Church.  Help celebrate!!!  January 11, 2009  5:00 to 7:00 p.m. Spiritual Bouquet In Preparation for the visit of his Holiness Pope Benedict XVI Week One The Pope’s Intentions for August. Spiritual Bouquet In Preparation for the visit of his Holiness Pope Benedict XVI Part Four The Pope’s Intentions for September. Cardinal John Henry Newman The path to sainthood © National Portrait Gallery London© National Portrait Gallery, London. The call to joy dominates the first readings and resounds as an unusual command, Joy marks the work of god at the time of the creation of the world. Preparation for First Communion. Theme 1 Community of Faith When people gather together because of shared attitudes, beliefs and interests When people. We will begin by making the sign of the Cross Leader: In the name of the Father, and of the Son, and of the Holy Spirit. All: Amen We pause to think of. Follow Me Follow me, said Jesus, follow me, if you are seeking wisdom, follow me, wisdom comes from knowing, that I am with you always, you will find. The Descent of the Holy Spirit & birth of the Church. Tuesday Faith Formation SHARING THE JOY OF THE GOSPEL. UNIT ONE The Church. I. What is the Church? Who we are 1. Church- the people who believe in Jesus Christ, have been baptized in him, and follow his teachings.